The Music Room, an underground music venue located in the heart of Sweet Auburn at 327 Edgewood Ave. SE, is an intimate concert location on the come-up in downtown Atlanta. 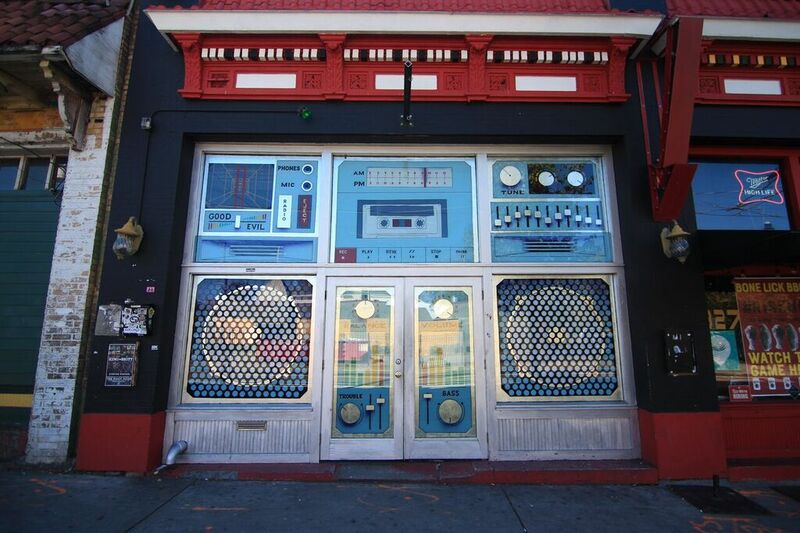 In the historical Martin Luther King District, The Music Room is hard to miss with its unique outer appearance. The venue is shaped as a blue old-school boombox with color changing windows on show nights. Additionally, for students living on the Downtown campus, the venue is so close to Georgia State it does not even require taking the bus. “It’s basically on campus, and we have tons of music geared to students. We host national and international DJs all the time,” Keiran Neely, Georgia State alumni and owner of The Music Room, said. When concert-goers enter The Music Room, they will see a small front room with a staircase leading into the basement of the venue. Walking down the staircase, attendees will approach a space about the size of a standard two-bedroom apartment. In that room is where the nightly music magic and memories are made. The underground venue has a casual charm with wooden floors, a small stage and a full bar. The Music Room has music appearances ranging from electronic DJs to classic rock. According to Neely, many of the shows are 21 and over, so be sure to check online beforehand; however, The Music Room is beginning to cater to a wider audience, so “all ages” nights are becoming more frequent at the venue. While tickets may sell out fast at this venue, what sets it above other concert locations is its intimacy between the musicians and the listeners. This venue allows listeners to communicate their opinions to the musicians and know them on a more casual basis. I recently attended a last-minute Drake Bell concert at The Music Room with about 30 other people. Bell asked what songs the audience wanted to hear and played songs accordingly. Additionally, one of the audience members called out the popular line “Hug me brotha!” from Bell’s former television show Drake and Josh. Bell causally walked off the stage at the end of his performance and gave the attendee a hug. In comparison, at competing Atlanta venues like Philips Arena, a personal encounter between the musician and an audience member is almost impossible. The Music Room also tops surrounding venues with its low prices on tickets. “Our cover charges typically range from free to $15,” Neely said. Most tickets are available online prior to the event; however, if the show is not yet sold out, attendees can purchase tickets at the door. Keep in mind, however, it is cash only. Luckily, they have an ATM available upstairs at the connected Bone Lick Barbecue restaurant. Along with the Bone Lick Barbecue eatery, the Edgewood Speakeasy is also connected to The Music Room. Located behind a secret door appearing as a regular bookcase, you will find another bar with a roaring 1920s vibe. “The Edgewood Speakeasy upstairs is free most of the time and features some of Atlanta’s best DJs,” Neely said. Overall, the exclusive venue and closeness of the space between the musicians and listeners impressed me. I would recommend The Music Room to anyone looking for a timeless “hole in the wall” space to listen to music, drink, and have an unforgettable time with friends.